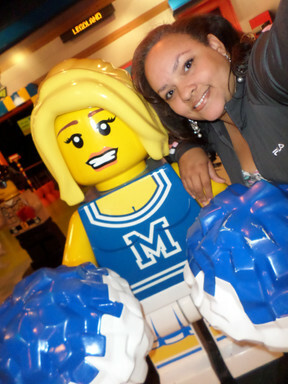 I was so excited to head to Legoland earlier this year!! I've been about 3 or 4 times since then and have enjoyed each moment. A lot of people that I have spoken with prior to going said that they expected more from the attraction but in my mind, how much more could it be considering that it is inside the mall. Needless to say, my exceptions weren't much so perhaps that is why they exceeding them. They also have an exhibit that changes each season. Over the course of my time having a season pass, there have been 2 exhibits. They have both been nice and contain a 'jungle gym' type of structure that allows for the children to have a play area type obstacle course experience. The other areas include a toddler play section with huge soft legos and cute lego statues, a 3D movie theater with special effects like rain and wind (not for the little ones, in my opinion), a cafe, and a special room with Atlanta-themed lego structures that are absolutely amazing and a moving lego branded marta train! There's also a small room that seems to contain a classroom setting where you can make lego collectables but in all the times I've been there, it's never been open. I think we'll try LegoLand in Orlando next! Has anyone been to the bigger LegoLand Theme Park Resort in Florida? What was the best part about it? ~ Purchase your tickets online before heading to the box office. You will save money and even have the option to purchase a ticket that comes with a lego collectible. ~ Phipps Plaza has underground parking that will put you close to the door of the section of the mall where LegoLand is. Only a few trips up the escalator and your there. They also have outdoor parking but that's a trek. ~ My favorite souvenir purchase is the "Minifigure" lego men and women where you get 5 for $15. (You can also use your season pass discount in the store so don't forget to ask the cashier.) Once purchased, your kids can "trade" them with staff members every time they come to Lego Land. ~ The season pass is worth it if you are going more than once. ~ Try to get as much information from the website as possible because you will almost never get anyone on the phone if you have a question. Other things worth mentioning include the fact that they have an adult night, rooms for birthday parties, toddler only days, and a store that is accessible to customers even if you did not attend the attraction. For more info on LegoLand Atlanta, you can check them out here.